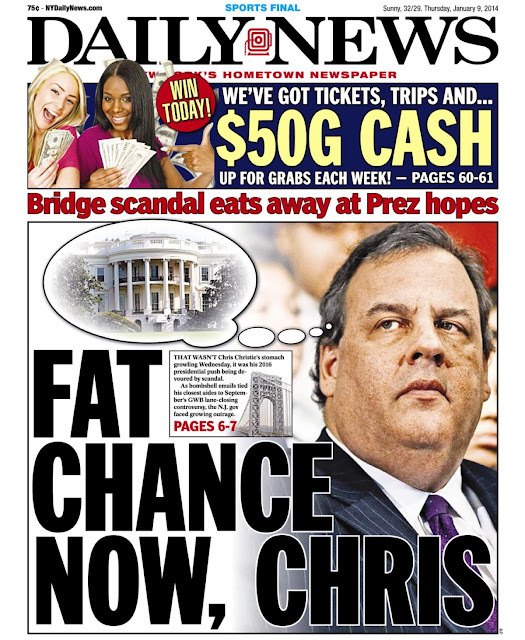 This Daily News front page from Jan. 9, 2014, is proving prophetic as Governor Christie's poll numbers sink, and he desperately vetoes bills on voter access, gun laws and other measures that don't play well in conservative states with early primaries. Even as Christie's presidential ambitions go down in flames, The Record's coverage has been unfailingly upbeat. Editor's note: Today's post has been expanded to include commentary on more of today's edition, as well as the lead story on Monday. Governor Christie won his second term with the lowest turnout ever in a gubernatorial election in New Jersey, so making it easier for people to vote threatens him and every other conservative. But The Record's coverage of his veto of the Democracy Act and 28 other bills awaiting his signature couldn't be more upbeat (A-1). Today's lead headline on Page 1 is surprisingly bland, containing a bunch of meaningless numbers instead of telling readers the governor vetoed early voting or a tightening of gun laws. Editor Martin Gottlieb also continues to politicize every measure passed by the state Legislature by reporting them in terms of Democrats against Republicans. Gottlieb and his lazy local assignment editors, Deirdre Sykes and Dan Sforza, never bother to interview residents on how they feel about the bills that were vetoed. The latest vetoes probably bring Christie's total close to 450 since he took office in early 2010 after bamboozling voters with a promise to lower local property taxes. Readers shouldn't hold their breath for Editorial Page Editor Alfred P. Doblin to call for Christie's resignation, as Ellen Stein of Closter does in a letter to the editor today (A-8). Road Warrior John Cichowski engages in fear mongering today with a column on the lack of "safety reforms" in a bill "to fix the nation's road and rail system[s]" (A-1). Readers have to plow through several long paragraphs jammed with numbers before getting to the top concern, lowering the legal age "for driving big rigs across state lines" to 19.5 from 21. Cichowski has got to be kidding. He knows the challenges facing older drivers like himself are a far bigger problem in every town and city in New Jersey, and the rest of the nation, and likely kill more people. He's just too lazy to report on any of the programs available to seniors to hone their skills behind the wheel. Dementia is the general term for a decline in mental ability, such as memory loss, severe enough to interfere with daily life, and Alzheimer's disease is the most common type of dementia. So, the lead paragraph of another Page 1 story is incorrect in reporting on a new law governing "group homes for patients with Alzheimer's and dementia" (A-1). The upcoming Thanksgiving holiday always dramatizes the continuing hunger problem in North Jersey, so why are Sykes and Sforza wasting so much of the Local front on hungry feral cats in the Meadowlands (L-1)? Municipal news goes missing today. Herb Jackson's front-page column on Christie's refusal to fix the state's broken Transportation Trust Fund was a rare critical look at how the GOP bully has sold his soul to the devil, in this case the radical Americans for Tax Reform (Monday's A-1). "It's easy to understand why Christie is offering solutions in New Hampshire to Washington's problems and saying little about Trenton's problems," Jackson says. "... He signed a pledge from Americans for Tax Reform after he became a presidential candidate, saying that he would not raise taxes." So, that means the simple logic of drivers paying higher gas taxes to fix the wear and tear on the roads they use is sacrificed to Christie's conservative principals.